If ever there was a moment we needed a show of unbridled joy, surely it’s now. 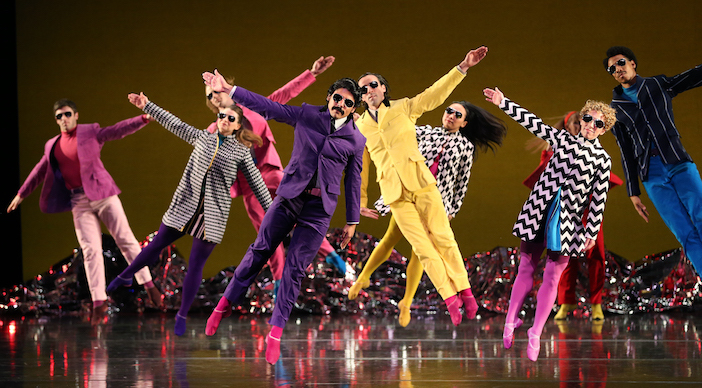 So if Brexit has left you marooned in a sea of gloom, head to Sadlers Wells for the perfect antidote, Mark Morris’s Pepperland – an hour (too short!) of the psychedelic Sixties when hope and fun (remember them?) were in the air. Created in 2017 as a tribute, 50 years on, to the Beatles’ Sgt Pepper album, Morris has naturally started with the music. But being Morris, he doesn’t use the Beatles’ own original music. Instead, composer Ethan Iverson has interwoven his interpretation of six songs with his own original compositions. This works. 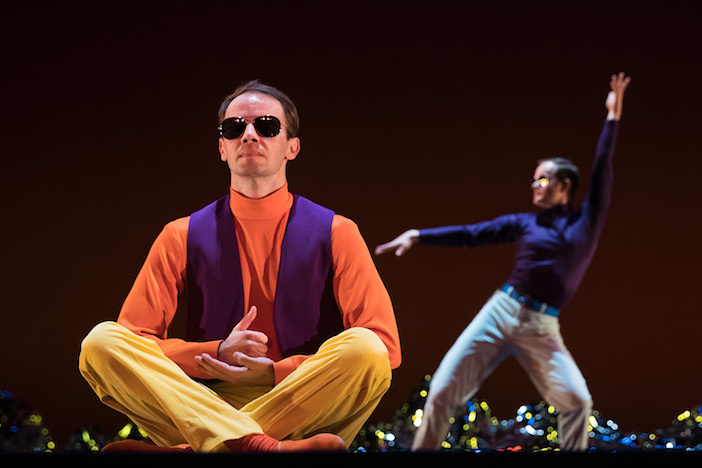 It moves from Maharishi-hippy to jazz and jive to counterpoint to baroque, carrying the dancers with it in their Carnaby Street neon-bright clothes, skinny suits, mini-skirts and shades (fab costumes by Elizabeth Kurtzman). The music is live – something Morris always insists on – and the musicians are brilliant though I must make special mention of Brian Krock on sax and Rob Schwimmer on the unearthly theremin and its almost-human voice. The real voice is Clinton Curtis whose singing voice combines both blues and operatic – on top of which, he introduces the dancers as the characters on the album cover – “Introducing Shirley Temple! Introducing Stockhausen! Introducing Laurel and Hardy! Introducing Oscar Wilde! Introducing a statue from John Lennon’s house” etc etc, you get the picture. With each announcement, the dancers embody their character and there are moments when they do quite a lot of mime, too. In A Day in the Life, for instance, they really do wake up, fall out of bed, drag a comb across their head. In a vaudevillian When I’m Sixty-four, a hilarious chorus line forms, extends and falls apart, all dancing to their own inner and increasingly idiosyncratic rhythms. 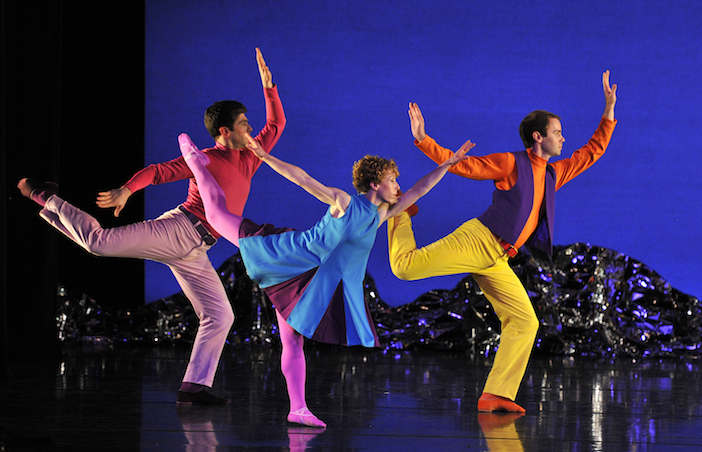 At other times, it’s pure dance with lines of dancers walking, leaping, cartwheeling or being carried across the stage in waves of colour, their patterns constantly changing. Or there’s a cosmic George cross-legged and upstage while the dancers unfurl mysteries behind him. Sometimes, there’s no need for anyone to sing the words – we know them so well we can hear them inside our heads as the music of A Day in the Life plays and the dancers tell the story. At the very end, the dancers sing themselves, quietly, a hymn to a lost innocence. Pepperland runs at Sadler’s Wells until 23 March 2019 and is then on tour until May 1. For more information, including tour locations and dates, visit sadlerswells.com.